Hitachi - your powering partner! When it comes to the cordless power tool technology, there is just one market leader and it is Hitachi! The dedication to build useful, time-saving, innovative and durable cordless power tools is proven in Hitachi cordless combo kits. The kit's power tools greatly help in managing cutting, drilling, or screw driving job with ease and is a valuable asset especially when you travel. If we take the example of 4 piece combo kit, it comes with two combinations: The first one to attract user attention is the 18-volt cordless combo kits. This comes with the 18-volt drill with 400 in/lbs of torque and a powerful keyless chuck, 6-1/2-inch circular saw, a reciprocating saw, and a lantern. The unique aspect of this cordless combo kit is the combination of circular and reciprocating saw. The circular saw features tool housing with a plate, carbide blade and a helpful spotlight in dark areas. The reciprocating saw has keyless blade change with carbon brushes on the motor which facilitates easy change. The lantern has interchangeable LED light enabling longer battery life. The kit has additional battery, a charger and a bag. The power exhibited is exemplary matching with finesse in making! When you need light weight and a power choose the circular saw, when you need some fast work, go for the reciprocating saw. The second one with the adaptable lithium ion hammer drill, reciprocating saw, circular saw and the work light with five-positions. The Lithium Ion combo Toolkit is exceptionally talented. The hammer drill is the one to rely on to bring a classy 570 in. /lbs. of torque which makes even the hard jobs of boring holes in concrete, a breeze. The next in contention is the circular saw which is heavy-duty blade (6-1/2-inch) which has a solid power. With all the above tools we are provided with a useful lantern which has fluorescent and LED lighting modes. This is accompanied with the two 3.0-amp-hours, 18-volt lithium-ion batteries which work longest amongst its peers (three times the life at half the weight). On the cost factor, when all of them were bought individually, they would be highly expensive (almost double the price). Wondering why Hitachi cordless combo kits are a boon for the construction industry and for DIYers? Their performance is appreciated, agreed! But with an exclusive warranty (for 10-year Lithium Ion tool) can any manufacturer beat this? Yes, they are durable. How is that achieved? Thanks to their operation within optimal voltage limits with HXP Lithium Ion tool and battery, they have excellent protection for their batteries. On higher surges, the technology of "Over Current Protection" saves the battery from being damaged. Their untiring research has to be commended for, when compared to traditional Nickel Cadmium or NiMH batteries, HXP Lithium Ion batteries have very high charge longevity. One important character in Hitachi cordless combo kits is their light weight. These workhorses need to be commended for their superior quality and superlative technology. Indeed, these light weight comrades should be tagged along!! 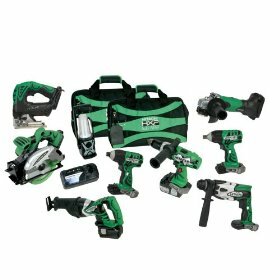 Return From Hitachi Cordless Combo Kits Page to Home - Finishcarpentryhelp.com.